- Painted different terrain below mountains and forest. - Placed some buildings and structures. - Added more accessible border pieces for monster spawning. If you are starting in stupid location like on an island, just restart the map. The first unstable build of the InDev 19 series is here! Hopefully, this unstable build will actually be pretty darn'ed stable. It's main focus is fixing bugs, doing some minor optimizing, and most importantly adding an entirely new road system to the game! Let me know what you think of the new road system down in the comments. There are now 5 tiers of roads, you can now build roads starting from tier 1 all the way up to 5. For example, if you wanted a tier 2 road, you'd first have to create a tier 1 road and build a tier 2 road on top. The roads will be built and maintained by new workers from a new building. Tier 1: Basic path. 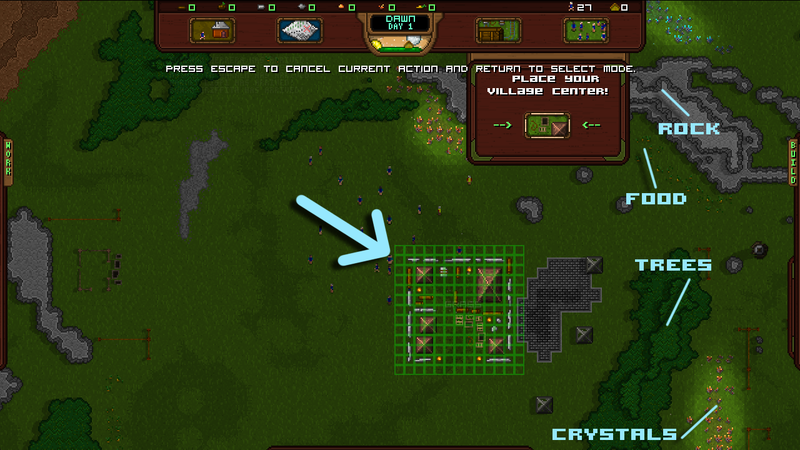 Villagers will automatically generate a basic paths in the ground in high traffic areas, offering a minor speed boost. The paths can also be built manually, for no resource cost, and function as the foundation to build roads on. Tier 2: Wood path. Costs 1 log resource per tile. Tier 3: Cobble and wood path. Costs 1 rock resource per tile. Tier 4: Board and cobble road. Costs 1 board resource per tile. Tier 5: Board and cut stone road. Costs 1 stone resource per tile. Note that because you need to have the previous road built in order to build the next tier, bringing terrain from nothing to tier 5 actually costs 1 log, 1 plank, 1 rock and 1 stone per tile. All road types will decay over time, requiring basic maintenance. The more traffic a road gets, the faster it will decay. A new Way-Maker Shack has been added to build and maintain the roads. The workers will automatically repair the roads as they start to decay, and facilitate any new road construction you assign. You can assign road work (to either construct, upgrade or dismantle) on the left hand work tab under the harvesting assignment buttons. The map editor now has a full complement of buttons and tools for placing and erasing roads. Fixed a crash that would sometimes cause the villagers and other mobs from being told there is a mob in range to interact with, when there actually wasn't. This effected multiple branches of the AI, like chatting, finding a mate, or finding a pack leader. Fixed a bug that would prevent a mob from finding something directly at it's feet, sometimes causing some search algorithms to run too frequently and slow down the game. Fixed a bug that would corrupt a mob's AI on load, causing the game to crash. Fixed a bug where deleting an already previously loaded profile and creating a new one in the same slot would clone the settings from the old profile. Most harvesting and clearing work is now assigned based on the closest location to the villager, rather than at random. Optimized the path finding and search algorithms, generally speeding up several areas of the game, mainly the AI. Adjusted mob tile positioning so their feet is center of a tile rather than their body. The debug menu (F3) is now a little prettier. The maps have been converted from a 8 layer system to a 7 layer system. The game will automatically convert old maps to the new system. Tons of small code cleanups. Minimap rendering process changed slightly to make topography more visible. Rewrote all of the tile set movement costs, giving costs to many tile sets on the map, like flowers, foods, stumps. Resources on the ground now increase movement costs on that tile. Added shadows to cactus, flowers, crystals and all foods. If your village starts to starve and there's no food anyone on the entire map, the game can hang. #4561 InDev 19 Road Map - The Road Update! InDev 19 development has started, InDev 19, like 18, will be bringing in loads of new content and game changing mechanics! This updates primary focus is on adding new defenses, roads, spawn systems and AI to the game. It will also flesh out many of the mechanics added in InDev 18. As always, the road map just highlights the biggest changes, there will always be additional smaller changes along the way. There will be 5 tiers of roads, you will have to start with tier 1 and work your way up to 5. For example, if you wanted a Tier 2 road, you'd first have to create a tier 1 road and build a tier 2 road on top. The roads will be built and maintained by new workers from a new building. A new "Road Worker" building will be added to build and maintain the roads. The workers will automatically repair the roads as they start to decay, and facilitate any new road construction you assign. More road tiers may be added in the future when more complex resources are added to the game. Golems and Other New Defenses! Several new defense buildings will be added, including the new Golems system. Golem Building - A basic defensive building that will generate Golems that will act similarly to guards, but are renewable. Meaning if one dies, a new one will eventually take it's place. These can be placed in heavy combat areas to keep monsters at bay and hopefully in range of your towers. Boost Tower - A tower that boosts the abilities of other towers! Healing Tower - A tower that very slowly heals any friendly in range. Bullet Tower - A fast shooting, low damage "machine gun" like tower that uses the same ammo as the sling tower, but can shoot over walls. Sniper Tower - An extremely slow shooting tower with very high range and damage. Likely will use the same ammo as the Bow Tower. A complete rewrite of the monster spawning system, opening the door for future changes. Monsters will now spawn anywhere on the map that is not inside the village. Monsters will only be able to spawn in open space, so they won't be trapped in tiny pockets they have to dig their way out of. Monsters types will spawn based on the type of tile they spawn over, setting up map-specific monster spawns in the future. Monster spawn rate settings will be added to the map, setting up for map difficulty settings in the future. These may not all make it into InDev 19, they will be added as time permits. If they do not make it, they'll be pushed into InDev 20! A church - A place to boost happiness, and while it's being used you'll also get a boost to your influence bar. The more people there, the more influence you'll gain on top of the usual gain rates. A hospital/clinic - You can assign villagers to work there and they'll become "field medics" who will run around healing fellow villagers. Later, this will also be a place pregnant villagers can go to give birth and their child will get some bonus experience for being born there, rather than at home or on the fields. Schools - A place where children villagers can go get educated. Children will gain experience when they visit the school, so they might get to start their adulthood a few levels higher than what they were when they were born. Auto-program mode that would read my mind and make all the cool ideas "just happen". Retro-Pixel Castles is a very brutal game if you don't play your cards right, this guide is designed to get you up and running. It's not all inclusive, but it'll get your village to a sustainable state! The first few days of Retro-Pixel Castles can be daunting, but the first one is probably the most critical. You will find yourself with absolutely no buildings, and you'll have to setup shop quickly. You will first need to find a place to place your Village Center. Placing your Village Center is simple, just click on the dropdown on the top GUI over on the right hand, and select a place you'd like to drop it. Look for a place with food, trees, rocks and crystals! You'll want to be near all of these in the future. Once your villagers are assigned, you simply need to select resources to collect. 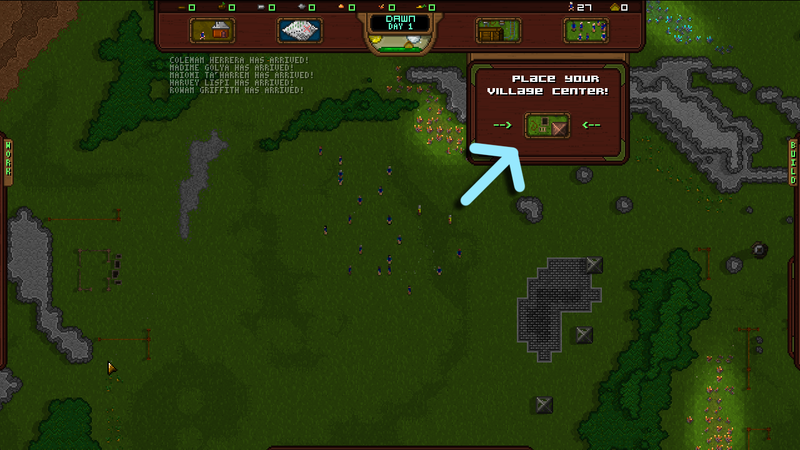 The village center requires both wood and rocks, select the assign work buttons for them on the left hand GUI and select some resources you'd like to gather. As soon as they are selected, your workers will head over and start the process! Once your Village Center is completed, you should probably build housing. You can select housing on the right hand GUI. You won't have the correct materials yet to build anything other than a few tents, so go ahead and place a few down. The builders will then go collect the resources needed and put them together for you! Next, you'll need a farm to feed yourself. Back on the right hand GUI click on "Farms" and select a farm you'd like to build. You can build either of the two current options at this time, so pick whatever you want. Now that you have farms built, you can start harvesting food. But you need workers assigned first, so be sure to unassign some workers from your Village Center, and then click on the farm and assign them there. Once assigned, you can click on the Assign Work (Food) button on the left GUI and select some food on the map for your farmers to go collect. Finally, you should probably build yourself a Guard Outpost and assign a few guards to it. You'll need these guys to defend your villagers while you work. Like the farms and housing, you can find the guard buildings on the right GUI. Just click "Defense". That's it! You're on your own now. You'll probably want to build yourself a Lumber Shack and Stone Shack next, get a Crystillery running and maybe get some magic buildings going. But I'll leave you to figure out the rest. Finally! After two hard weeks of completely rewriting the main menu, InDev 10 is here! Most of the changes were behind the scenes in preparation for the upcoming save system. Most of what you'll notice is some bug fixes, and of course the new GUI. Enjoy! - Added mouse scroll wheel zooming. - Completely rewrote theMain Menu GUI. - New Map Pack system added, you can now bundle your maps into map packs, instead of everything all being in one folder. - You can delete maps (and map packs) within the game now. - Selecting a terrain category in the map editor no longer auto selects a terrain. - Renamed "Gathering Buildings" to "Harvest Buildings"
- Fixed a bug that would cause the map editor to crash when moving/deleting farmland. - Fixed the grab tool, it now works correctly. - Fixed a bug where if you dismantle a building that has resources, but has not been worked on yet, it would delete the resources. - Moved all the user maps to the "Developer's Choice" map pack. - Updated all the old user maps to their latest versions. - Added user map Altaria, by Kingroka. - Bunch of other small fixes/tweaks. Enjoy! Don't forget to report any bugs you find! Pre-Feedback Disclaimer: Yes I know a lot of these things I will talk about are already known. However I feel it is important to give a comprehensive overview of what I saw in the game. I also already know a lot of these things will 100% be fixed in near future patches, again its just a comprehensive list of feedback and opinon. Art Style is mostly perfect and looks great. I would suggest doing a clarity pass to make sure that stuff is easy to differentiate. I mistook flowers for food crops on my first run for example. ​The premise and set up of the game is also fantastic. From launching the game and going to the world map it was very exciting and fresh. I was really looking forward to exploring the game when I started it up, which is a good thing especially when you consider I bought the game as an afterthought. ​The game ran great, even when I was getting to the point of hitting the double digits of days on my 3rd/4th run. Very little slowdown or artifacts. Only a 100-1,000ms pause when autosaving which was very manageable. ​A lot of people under-rate tooltips and information windows in games. But for me its very important that I have the information I need available to me. While there are certainly areas to improve, overall it is heading in the right direction. ​Its great that you went in the "God Game" direction for the game a little bit by giving you spells and abilities you can use to interact with your villagers and help them. Considering most of these sorts of games are heavily hands off it helps smooth out the gameplay bumps that can arise as a result of that hands off nature. The basic gameplay systems(building, harvesting, spells) all feel quite nice and work well together to create an interesting foundation for an experience. Some spells are redundant, E.G. Grab interaction with banish/summon from limbo etc. Mostly needs a mechanical cleanup and finishing touches before it can be critiqued in a more complete state. Flame spell is a bit useless. ​You're probably aware of most of the issues surrounding villager AI, but I would just like to reiterate that waiting for them to run up to a building and do the last tap to complete it is a bit silly, as its often some villager miles away thats holding up the process. Theres also their in/out-of-combat behaviour being very opaque. I'll often see villagers bum rush a zombie to take him down, and other times I'll see dozens run away from a solo zombie in terror. ​There is no way to manage stockpiles in a meaningful way. For example, if I want to make a stockpile near a construction project to speed things up, I have no way of telling my villagers to fill that stockpile up. The Stockpile Management suggestion will cover my ideas for solving this problem. ​There are very limited ways to interact with your environment Certain things can be removed, others can't. Water is just always in the way and offers no gameplay impact other than being a nuisance. It would be nice if we could fill in or create water/Tar etc. ​The lack of a tutorial, or graduated easing into the gameplay is a problem. While a tutorial isn't important at the moment, it will be as you reach final release so its worth keeping in mind. The learning curve is also a bit wonky. I suggest creating a Simple "Tech Tree" similar to the harvesting tech unlocks but for buildings, There is already a rudimentary form of this implemented in the form of the first building blocking construction until its finished. Basic concept should be -> Buildings that need refined materials could be greyed out (but still clickable for city planning I suppose). A similar "Tech Tree" could be implemented for spells, to prevent spells being thrown en-masse at the player. For example when the first monster spawn appears on the map the player gets a pop-up about combat spells and a little blurb explaining each one with a small packet of influence to experiment with. Directionless Gameplay, Poor execution and absent minded ponderous pacing. Under-utilization of mechanical potential. Lack of Gameplay Punctuation. My biggest criticism of the game is that the core gameplay loop: Build, Harvest, Defend, is supported by very weak mechanics in some areas and ends up feeling a bit anaemic. The idea of creating a creature maze that they have to navigate a la a tower defense game is brilliant in theory however the execution of this in-game is rather... boring. Its such a great mechanic potentially but it just falls flat somehow. It needs some iteration upon to get to a good place in my opinion. I'll elaborate on my ideas for this below. ​Whats the point of surviving? Why do I care about surviving? Whats the end goal, whats the end game? A game without win-conditions is fine, but even games without definitive end-goals have interesting checkpoints on the way to end game that punctuate the gameplay with power spikes. For example getting a particular tower that is utter ownage for a while in an Endless Tower defense game. It feels very aimless to just try and survive. While there are many people who enjoy the pure survival aspect of a game, I feel that ultimately the game will suffer if there is not some form of an end game "soft" or "hard" win condition[With the option to keep playing afterwards]. A lot of people like to play in bite-sized chunks of 30minutes to 1 hour. Having bite-sized goals that are achieveable in those sorts of timeframes will keep them engaged, even something as simple as unlocking a particular tower and placing it down let alone finishing the construction. I'll talk more about this in the suggestions section. ​The pacing of the game is way off in my opinion. The first day starts off relatively peaceful with no challenges offered to the player. The next couple days are all right with a gentle curve upwards keeping the player on his toes. After that, the curve becomes vertical. It just seems so out of the blue that after day 4 my castle is under constant assault day in-day out with no breathers no matter the time of day. I feel that this ultimately damages the overall experience. A lack of punctuation between assaults due to attacks continuing during the day time gives the player no space to expand their initial holdings without great difficulty. It should be possible to expand a wall out a bit in the day time but I found that near impossible practically due to the constant assaults through my wall mazes and choke points. I have some suggestions for improving this I'll talk about below. 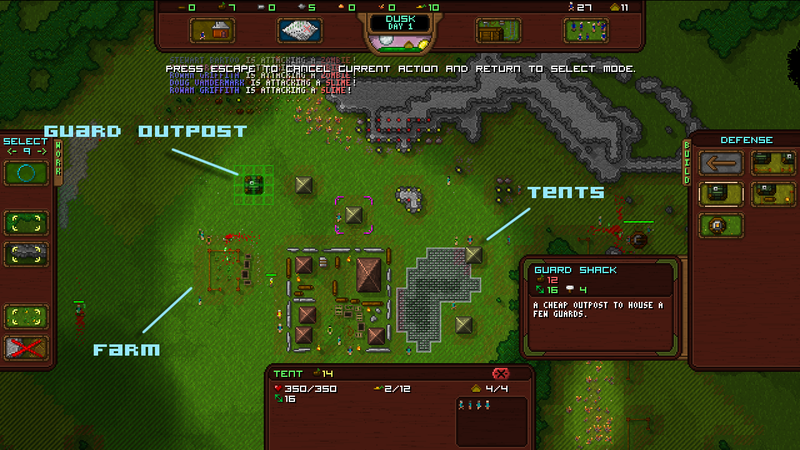 ​There is so much going on in this game, a dash of Dwarf Fortress, Tower Defense, RPG, Populous and more. These are all fantastic games and genres, and they have the potential to coalesce into an amazing experience. However, the tentative implementation of each "aspect" leaves the entire game feeling rather shallow. It has bits of RPG tossed into the mix, but ultimately you went with an uninteractive form of character progression with citizens seemingly progressing at random. You could remove people levelling up and it wouldn't fundamentally alter the gameplay. That to me suggests it needs work. The "God Game" aspect also is shallowly implemented, you can pick people up, drop them places, move resources, use spells and do all sorts of things that should be cool but end up feeling a bit pointless. Why not make the heal spell single target instance heal, so I can save a particular citizen or a group of them in a small aoe. An aoe healing font spell just feels weak. Just one example. The "Tower Defense" aspect of the gameplay is similarly a bit weak. It has the foundations of a great mechanic, just like the rest, but ultimately the lack of tower diveristy and mechanics aside from "shoot to do damage to [Single-Target/Crowd]" makes it feel almost like an afterthought implementation. Wouldn't if be awesome if you could make moats, lay down tar on Black Sands, spike pits, have slow towers, etc etc. The "Dwarf Fortress"/"Ceaser"/"Master of Olympus" aspect of the game is again[broken record at this point] a bit shallow. I honestly can't point to exactly what bothers me about it, but I think its the lack of things to do. Mostly spam food storage after getting basic infrastructure and defenses up, then switching over to higher tech. Over-all, while this is my biggest area of criticism with the game, its also what I think has the potential to be the strongest area, if only you(we?) can figure out the bumps and dents to make the experience feel smoother and great. Pre-Suggestions Diclaimer: I'm not claiming every single thing I thought up here would be good for the game or even possible. These are just the things that came to mind when I was thinking of solutions for the problems I had with the game and the stuff I would like to see implemented. ​Implement a "Tech Tree for spells"
​This is honestly an area I have near zero experience with development wise. Good luck! Have People look for the resource unit closest to the project they are working on, not closest to themselves. Allow the player to designate resource flows from Production building to stockpile, stockpile to stockpile, stockpile to Production building. Stockworkers move resources around. ​Let us spread wood/food crops with people. It should have a trade off, e.g you need to cut down 4 trees to spread 1. Let us fill in/create water/tar/map specific terrain. ​Implement a tutorial at sometime in the future. Add more soft progression gating to the buildings to help new players cope with the options. Also include the spells "tech tree". Execution, Direction, Pacing, Mechanics and Gameplay Punctuation. ​Make it so that all undead creatures are severely weakened during the day and die off by about mid-day. Its all about intensity. Right now, Day and night don't feel different from a gameplay standpoint. Opinion warning. The idea here is to create a defined space between each stage of the day. Past the first few days of gameplay this definition becomes increasingly blurred. The player should be able to tell what time of day it is by whats happening in the gameplay. Dusk should be the "Hunkering down" phase of the game, setting in for a long night with the first few sporadic undead harassing the walls. Night should be the pants filling waves of undead, elementals etc crashing against the walls of your fortress. Dawn should be the crest of the wave, when the assault becomes it's most frenzied but begins to weaken and break with the advantage of the sun for the townspeople. Midday should be the reconstruction, consolidation and expansion phase of the game. Walls are rebuilt, towers rebuilt, and new more ambitious defenses are constructed. The main obstacles should be relatively harmless slimes occasionally wandering into villagers or near the town. Evening is when the first undead should begin spawning for the night assault. The outline above, I personally feel, would give the game a great sense of distinctive gameplay stages, the night phase being the Tower Defense stage, the Midday being the "Dwarf Fortress" stage and so on. This would give the game a much better gameplay flow in my opinion. A "Seat of Evil" which you must send human warriors out to fight and defeat in the ultimate battle for the land. A Building you need to build to cleanse the land of evil. Survive x days, with the final day having an ultimate assault on the town. ​Pick a defining aspect of each genre your game shares a lineage with and make that the ultimate representation of those genres. For example the Tower defense aspect you could pick the Wave based nature of tower defense games[A la my suggestion above], and build other mechanics around it. For the god game aspect, you could go with any number of choices. But the main thing is that each mechanic needs to have its defining feature, in my opinon, to make it mechanically stand out and add to the experience. For the RPG aspect you could choose to go for a Macro level customisation, where as the collective levels of your villagers go up you can pick talents(+5% movement speed off road), or a micro level randomized customization where your people develop traits randomly as they level (E.G. "Light eater" -20% hunger drain). Thats my feedback for the game. I'm sure not everything I wrote will be helpful, and I'm sure you wont agree with everything but I am sure that I've definitely said some things about the game you haven't heard before. Edit: In case its not clear, I love the game but I am very critical of things I love. The high-content updates keep on coming! Here's Unstable 4, an update full to the brim with a bunch of new content, bug fixes and tweaks. A large majority of this patch was based on your feedback!, so I hope you all enjoy the changes you made happen! You may need to delete/recreate your profile if you discover you can't start new Skirmish maps! - New Bow Tower has been added, a mechanical tower that only cost basic resources to build (Rock and wood). But requires ammunition to fire. - New Bowyer building has been added along with a new job, the Fletcher. The Fletcher can manufacture logs into arrows at the Bowyer building for use in the new Bow Tower. - Reduced the cost of Sturdy Walls and Wood Walls to 2, and Stone Walls to 4. - Cullis Gates now start to eject things at random when they're overloading. - Radiance Pools no longer shoot projectiles at nearby mobs, instead they trigger an aura effect that affects everything in the area. - Fixed a bug causing villagers to ignore their work chance flags, making them sometimes work themselves to death instead of finding homes, mates or just taking a break. 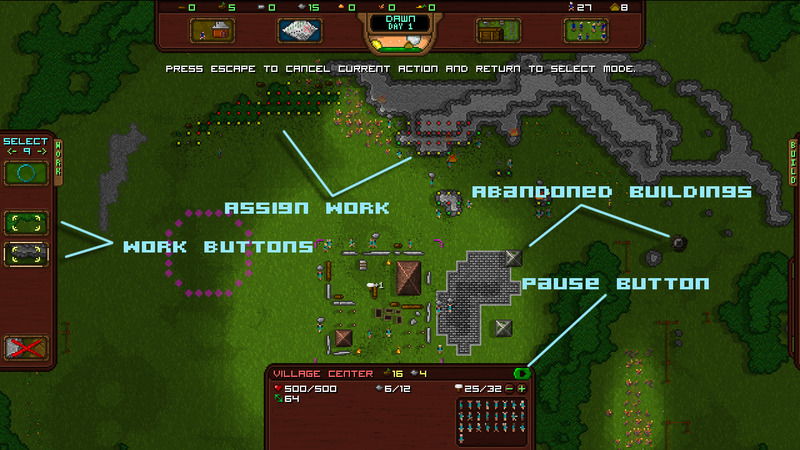 - Fixed a bug where workers would not stop working, even if their hunger or energy is too low. - Workers are now less inclined to work, giving them more downtime to do other things. - Increased villager chat rates. - Increased the chance a villager will become a mate with another villager they are chatting with. - Optimized the weather system, improving frame rates during intense weather and adding more efficient particle generation based on the game's zoom level. - Improved the overall rendering and update speeds of the particle system. - Fixed an issue with particle generation on the object icon overlays, causing them to generate particles even if they were off-screen. - Large Storage Building now displays everything it is allowed to store rather than just the first few on the list. - Mob's tile coordinates are now displayed in debug mode. - Reversed the tile variance changes from Unstable 3, they were sometimes causing coordinate positioning problems. - Added missing shadow and collision maps for the new Ancient Cullis Gate and Ancient Radiance Pools. - Improved the search algorithms for all objects and mobs in the game, slightly increasing the overall speed of many of the game mechanics. - You can now "Poke" dead bodies, making them decay faster and release some extra essence. - New spell; The Grab Spell/Tool. You can now pickup monsters, villagers and resources on the map and move them around. 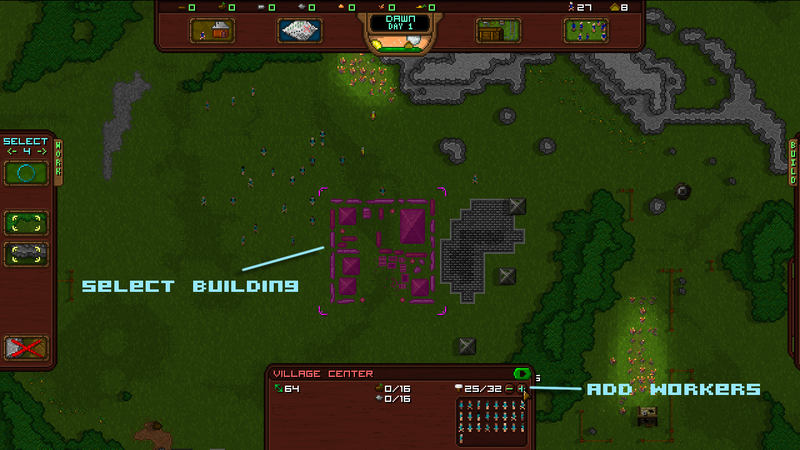 You can even grab resources directly out of buildings, or harvest them yourself right off the terrain. - New spell; Resurrect. You can now resurrect dead villagers if you see any ghosts wandering around in your village. Be careful though, there's a slight chance they'll come back as a zombie! - Dissolve spell now also dissolves corpses, turning them into additional essence. - The old Limbo spells have been removed from the game. - Moved all the spells to the center top GUI. - Added an "Available Worker" count to the top bar on the GUI in parenthesis next to the total villager count. - Cullis Gate mechanics have been completely rewritten. You can now use the new grab spell on a Cullis Gate to grab a random creature or resource from Limbo. You can also drop creatures and resources into the gate, sending them to Limbo. - If used too much too fast, the Cullis Gate can explode. - A bunch of new particle effects have been added, and some older ones altered. - Essence now tends to float to the nearest collector, rather than a random one. - Ghosts now appear more often. - Ghosts are no longer attracted to the Cullis Gate. - Buildings no longer catch fire unless they specifically take fire damage. - Builders and Crystillers can now build with crylithium. - Starting a new map on the World Map will now always sent 32 villagers, and 50 resources. - Fire Bolt Tower now requires crylithium to be built. - The Limbo tab has been slightly redesigned. - New Ancient Cullis Gates have been added to the game, they work exactly like the regular Cullis Gates, but can be found naturally on the map. - New Ancient Radiance Pools have been added, they cannot be built. They attract creatures to them and sap essence from other sources on the map similar to an Essence Collector, then convert it into an energy bolt that will both heal and give experience to nearby creatures. - Increased refining speeds for all buildings that can refine. - The position data has been changed slightly, making mobs move and stand around in a little more natural positions instead of always being centered on the tiles. - Fixed a crash when trying to take resource from the map and send them to Limbo when they're in-use. - The wandering rates of monsters have been reduced slightly. - You can send villagers and resources to Limbo in Skirmish mode. This should not be allowed. 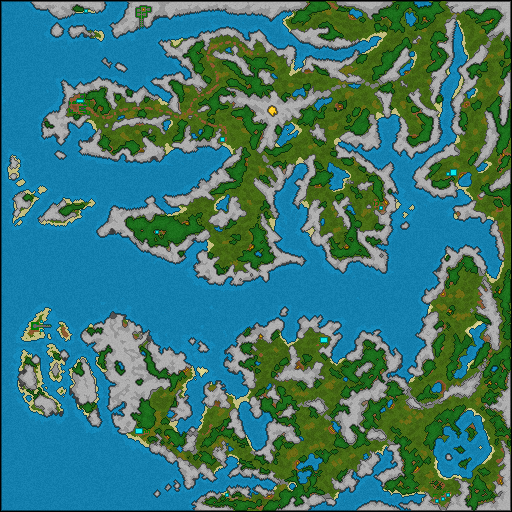 - If your world map data is obsolete or otherwise unusable, sometimes you may not be able to start a new Skirmish game. To fix this, just reset the world map or create a new profile. - The tips system is grossly obsolete after all the changes in InDev 18. - You may need to delete/recreate your profile if you discover you can't start new Skirmish maps! 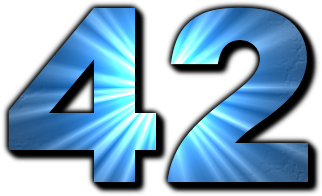 #3207 Build InDev 14d Released! InDev 14d is out, this mini-patch's main focus was to add the heavily requested Clear Terrain function to the game and throw in a bunch of tweaks and bug fixes before starting in on the next big patch. Warning! : One of the changes in this patch greatly increases the base stats of all mobs across the board, meaning old save files will be completely crippled. Sadly this means your villagers will probably find themselves barely able to move due to the new movement speed calculations being based on the new stat system, and they'll be slaughtered very quickly by the first newly spawned mob that attacks the village. I highly recommend starting a new game! - Clear Terrain tool added, you can now assign terrain to be completely obliterated by your builders, but the process will not return any resources. - Reduced the Fire Bolt tower costs from 15 energy to 10. - Villagers are much more willing to flee when outside the village. - Mobs now reconsider their combat targets when they are hit, occasionally turning around and attacking their attacker even if they already have a target they are chasing. - All mob stats have been increased across the board. - Pregnancy chances have been increased slightly. - Fixed stone shack description. - Fixed a loading crash when some particles wouldn't load correctly. - Greatly increased monster aggression, they will almost never run away anymore. - Alerting other villagers of an attack will no longer occasionally pull the entire villager. - Tweaked the selection dot graphics a bit. - Total housing is now displayed in the top GUI, instead of total buildings. - Monsters now gain much less experience burrowing through terrain. - "Total Heroes" added to the population tab. - Ghosts can no longer be selected when they're invisible. - Fixed a bug that would allow adults to couple with children (Eww, I know right?) that could eventually crash the game under very specific conditions. - Tweaked the mini-tutorial overlay on the village center. - Combat AI now disables if the mob is "stuck" (standing on a blocked tile), preventing a AI related crash. - Slightly increased all villagers movement speed. - Can no longer build on any rough terrain of any kind. You need to clear it first! I shall give you the answer to life, the universe, and everything! Use this great knowledge wisely. #216 Hello from the northern hemisphere! Hello everyone, Ferret here! Currently a 150$ Backer and a person of high hopes for the development of this game. I hope to get to meet a lot of like minded, nice, and intelligent individuals here as we all embrace Raymond in his quest to bring us a game worth playing. I found this game by checking my old email account and then noticing an Email from SixtyGig in it. I opened up and read it. Got curious and then checked out the links. To my surprise I was caught up with joy as a person who loves retro games. I recently backed RimWorld and have been looking for another game to throw my money at. So now here I am now being impatient for the next retro game to throw my time at. How dare you be unprofessional! Yeah, the forums are a bit slow right now. I guess that's expected since RPC is still a fairly new game. I suspect it'll pick up a great deal as the game transitions out of it's "InDev Tech Demo Toy Thing" into a more functional and rounded game. Random discussion is good though, keeps us all occupied while I work on the game. If anyone is ever bored, I also keep a semi-public record of every screenshot I've ever taken during the entire process of development from day 1 to now. Hey all, thought id make a post for a map I made, plus any I create in the future. -Rocks have gravel under them. Crater: Download to test: CLICK ME HERE, NOW! Desert of Death: Download to test: Unavailable! Doesnt work, Villagers go NUTS trying to repair buildings. I always liked survival in a city ever since the Night of the Living Dead custom map on WC3, so a city map is one that I tried here. Takes to long to mine, so no DFness . Simple as that. wanted to give a bit of a siege (heh) aspect to the map, and maybe have monsters spawn in tunnels too, but alas is was not ment to be. Last: If the images are to large (As I have a large screen) ill compress them.